Late Saturday afternoon/early Saturday night during the late spring could be my favorite time to go out. 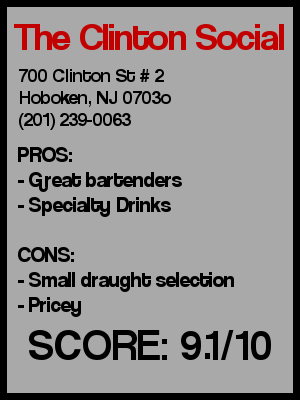 Bars aren’t overly packed so you can easily find a prime seat, it’s easy to get the bartender’s attention, and it’s a nice relief from the running around a weekend typically brings. 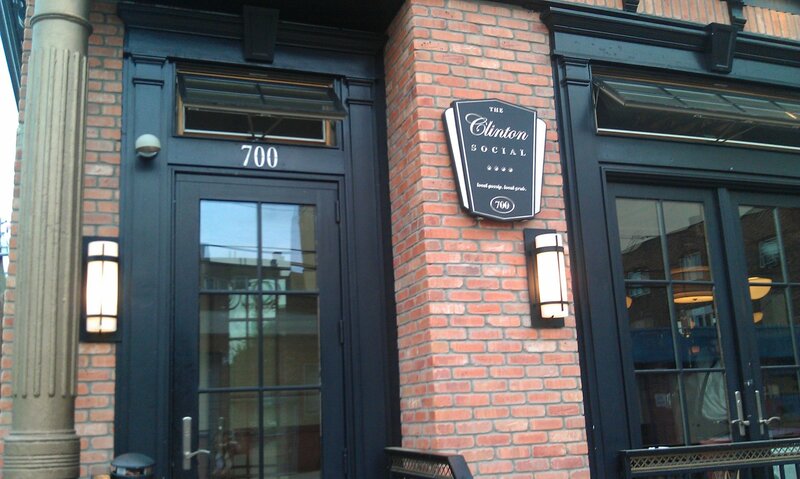 We headed over to Clinton Social, a fairly new establishment on 7th and Clinton Street right next to the A&P for a few pre-dinner drinks. As we walked in, I was pleasantly surprised to find that the place was decently full. 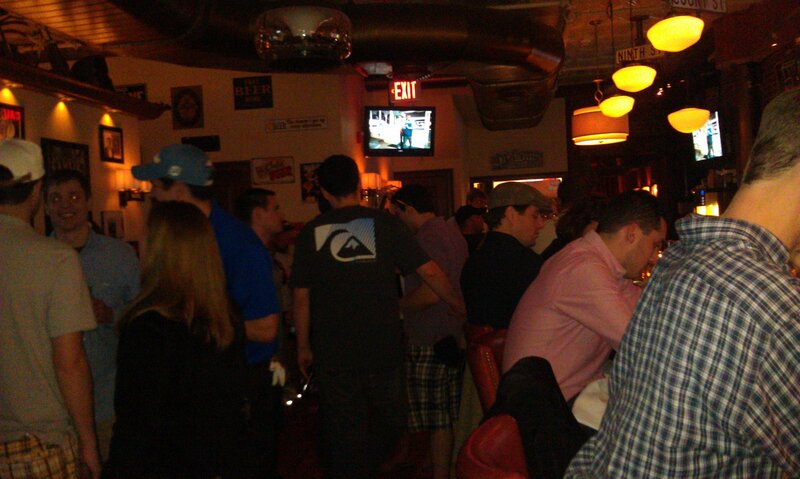 Most of the bar stools were taken, as were some of the high tops, but we managed to get 2 stools with the desirable one stool gap in-between us and the next patron. It wasn’t just the patrons who were friendly, but so were the bartenders, especially Peter (IIRC). We talked home brewing, his native state of Indiana, and just general observational conversation points. He talked me into their Arnold Palmer, which is one of the numerous specialty drinks that they are known for. Served in a mason jar glass with homemade lemonade it really is a must have during the spring/summer. The price is a little steep at $10 a pop so you can go into a deep hole if you drink them all day. Peter also bought my date and I shots in honor of my recent graduation. I got the mango-strawberry infused tequila and my date got the pineapple infused vodka. Both were really tasty and easy to put down… and the comped shot was very much appreciated. 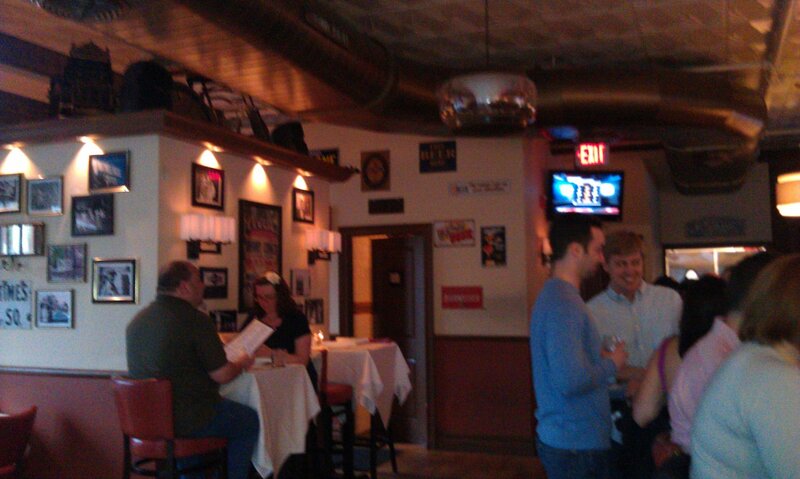 Being relatively far from the Path and Washington Street, Clinton Social is definitely a place for the locals. One such local is an African American transvestite who used to be known in the west village scene. Now she spends a little time in Clinton Social but is very unobtrusive. The bar is tastefully decorated with old Hoboken street signs hanging down from the ceiling (like 3 A’s) and a nice uncramped amount of open space so people can comfortably congregate between the physical bar and the tables. 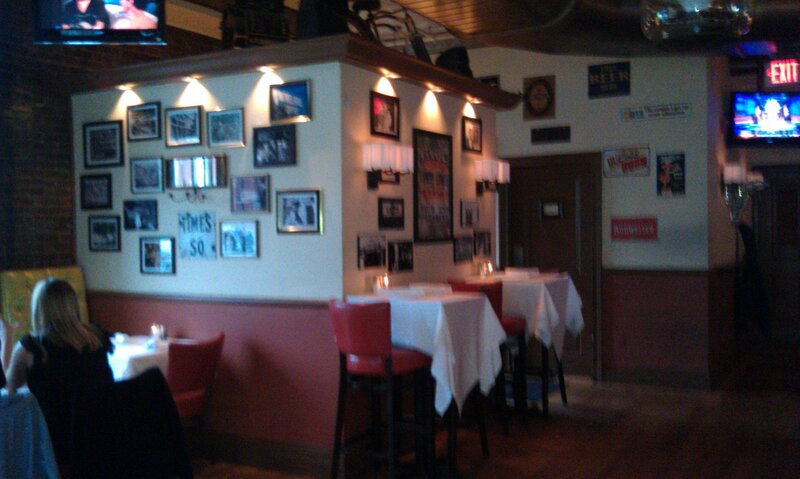 There is also a back dining room where they serve some of the better bar/restaurant food in Hoboken. Thankfully they brought over the French onion soup dumplings from their sister restaurant, The Madison, so I don’t have to go as far to get my fix. I’d highly recommend them. So after at few drinks and some good appetizers it was time to go have some dinner. Preconceived notion – Looks like a pretty classy place from the outside. I know they are owned by the team behind The Madison which tends to be a little pretentious, but also serves good food. Bar Type – Restaurant/neighborhood bar. Crowd stereotype – Mainly 27+. 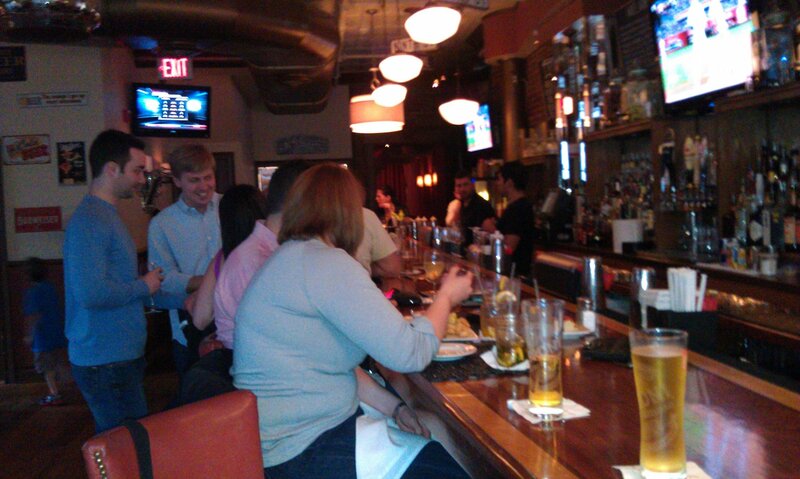 Some older (40+) patrons came in to grab a food and drinks. Music – Pretty standard rock/modern rock. Value – The Arnold Palmer was great, but a little pricey. But we did get free shots from the bartender, so that bumps them up in the value department in my book. First or last drink of the night – First, last, or every drink of the night, this place is great for drinks.